Happy Grandparents Day from Volunteering Matters! Home / News / Happy Grandparents Day! To celebrate Grandparents Day we caught up with some of our amazing volunteers and staff, grandparents and grandchildren alike, to find out how they’ll be marking the occasion. Sporting Chance has been a huge success in Middlesbrough and Stockton-On-Tees and launched in Sheffield earlier this year thanks to support from the players of the People’s Postcode Lottery. Project Development Officer Jamie tells us why he was inspired by his Grandma Mavis to get involved with the project. 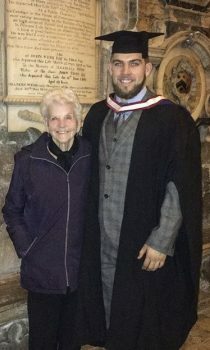 “I’ve always been inspired by my Grandma’s ‘can do’ attitude in terms of helping others. She’s not afraid to get her hands dirty and get involved and has always been there for me and my mum. How will you mark Grandparents Day? Sporting Chance offers a range of free activities, such as exercise classes and social groups for men over 50. If you’d like to get involved visit the Sporting Chance project page. John has been a volunteer driver with Volunteering Matters for the past 9 years. He is part of our Help to Health scheme in County Durham. 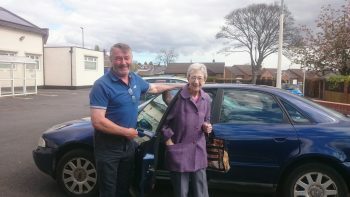 Our volunteer drivers help older and vulnerable people get to hospital and health care appointments, helping them maintain their health and independence and reducing social isolation. A grandparent of three children aged from 11 to 13, John also celebrates his birthday on Grandparents Day this year. I’ve been volunteering as a driver for the past 9 years. I do it in the morning, it gets you out and you get to meet very nice people who really appreciate the help that you give them and you get to have a nice chat. You can really see it’s helping and it’s well appreciated. What do your grandchildren think about your volunteering? They think it’s good. They’re always asking about it and they’ve seen some of the pictures of me with my passengers. Well it’s on my birthday and with my wife’s birthday around that time too we’ll be having a family celebration. If you would like to find out more about becoming a volunteer driver, visit the Help to Health information page. We couldn’t celebrate Grandparents Day without a thank you to our wonderful Grandmentors team, some of whom are pictured here. Grandmentors is an innovative project using the power of inter-generational mentoring to support care leavers who may be in challenging life circumstances. 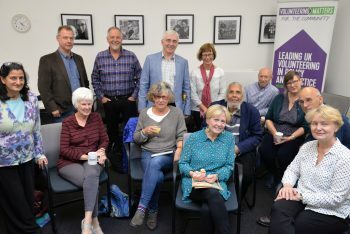 These mentors are volunteers aged 50 and over who use their wisdom, their energy and their life experience to help keep young people leaving care on track. Our volunteers mentor young people across Hounslow, Islington, Ipswich and Folkestone. To find out how you can get involved, visit the Grandmentors project page.